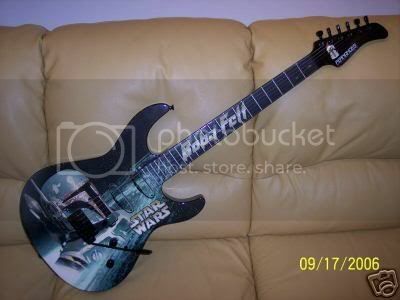 What are the hardest and rarest items to get that are Fett oriented? 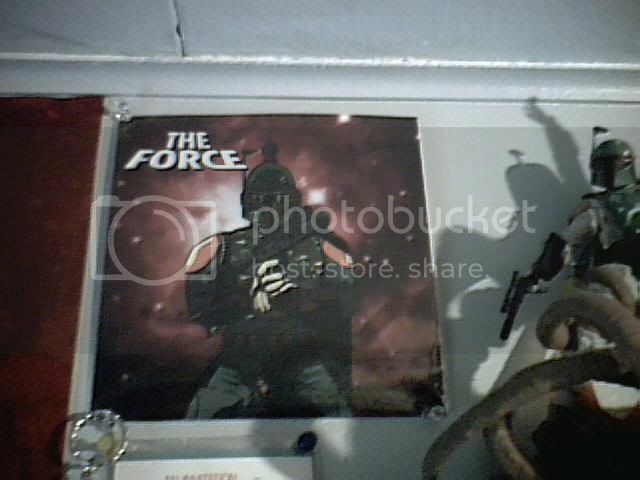 I'm not saying this to brag but i've only seen 5 of these on ebay ever and don't know if any one else has or seen this but i got one a few months back, the record itself has the rebel sign but the case if all fett. "Power of the Force" figure, and the chrome version of the new Attacticks series four figure. the card board cut out one? just curious. Nice poster i have never seen it before. Yes it is. It was also sold out on StarWars.com the last time that I checked. The hardest and rarest is probably an actual rocket firing prototype Boba Fett action figure. Then, up there on the list is the Droids Boba Fett figure and the Bronze Boba Fett statue that was released a while back in the 90's. There's also the lifesize Don Post statue. Those are the ones I don't plan on adding to my collection anytime in the very near future, unless I happen to win the lottery. lol hey i was looking at my mail-in figure and was looking at the droids figure, they're identical, does anyone know the difference? Seven dollars!!! I got it for fifty dollars! I was actually lucky enough to get it for Christmas. I believe the way they tell them (the different variations) apart is by the copyright date that's molded onto the inside of the leg. It's different for each mold. Other than that, they're identical figures. Even the coloring scheme for the Droids Boba Fett figure is the same as the regular one. However, Hasbro stated that they're finally coming out with an actual "Droids paintscheme" Boba Fett figure next year, along with a Boba Fett "concept art" figure (similar to the Ralph McQuarrie Stormtrooper concept figure released a few years ago). thats going to be sweet. hopefully not to expensive though. Hey heres another very hard to come buy item, only 75 made. heres the link if anyone is interested in bidding. heres a pic for others who dont want to load the site. p.s. this thread made it to the main page if anyone noticed right next to Karen Traviss' link, sweet deal. I have an old loose boba figure who's copyright is 1979. I got it for 9 dollars at a flea market. sweet deal, did it come with the blaster too? I also got one (opened) at some cheap "mimi-mall" for fifty cents, and sold it for two dollars. No blaster. But it's ok. I bought the unopened one, and I needed a few more dollars for something or other when I sold it. 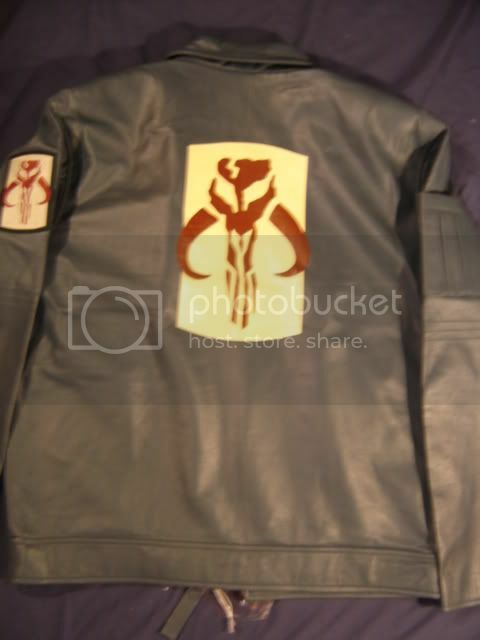 So i've been doing more research on the subject and found out that there is a Japanese leather jacket out there some where. anyone seen it? Eww not very cool looking . i mean this with no prejudice but...what were the japanese thinking? 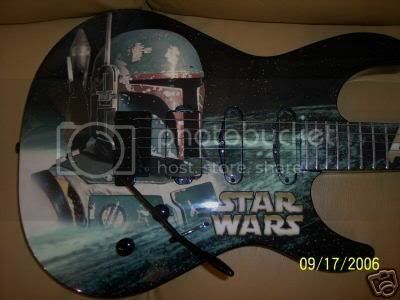 i mean it's ugly yes but, it demeans fett in a way because it is so ugly. 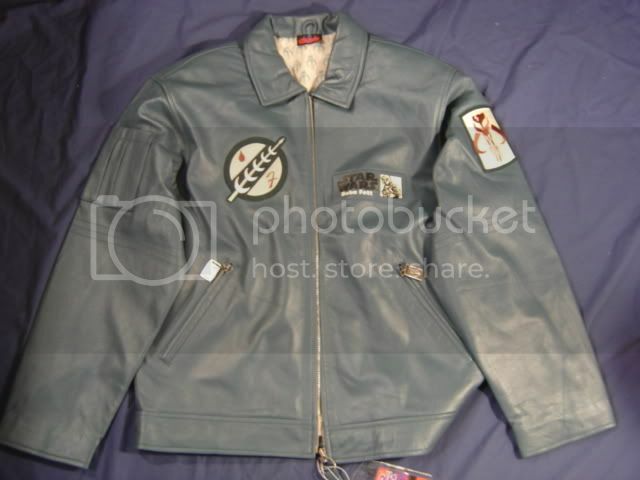 I think they were going for that pilot patch bomber jacket thing. Like everyone was wearing after Top Gun first came out.